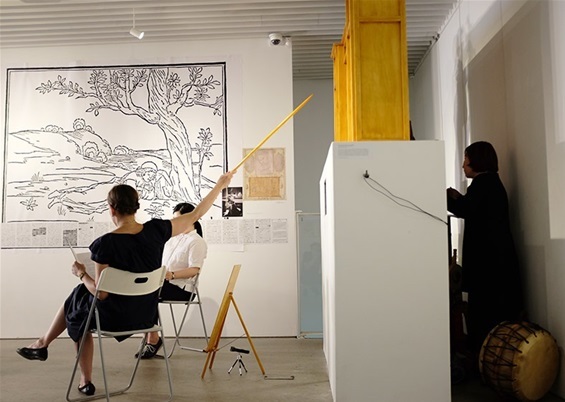 Recreating a Moving Panorama Performance Which Hadn't Been Seen in 130 Years. The Velaslavasay Panorama in Los Angeles, California. In addition to panorama paintings, they have a very magical garden. Plan to visit if you are passing through LA. 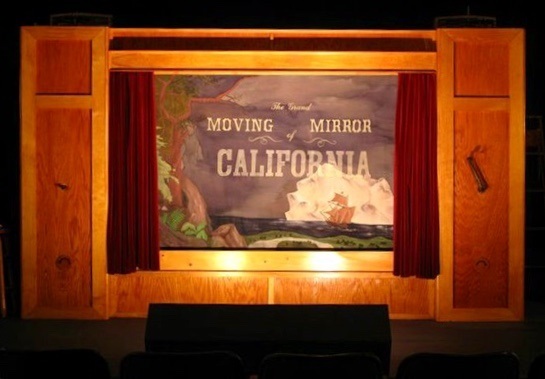 The Velaslavasay Panorama in Los Angeles, California, is a historic exhibition hall, theatre and garden dedicated to the production and presentation of unusual visual experiences. Sara Velas, Museum Director of the Velaslavasay Panorama, past President of the International Panorama Council and crankie/moving panorama artist! 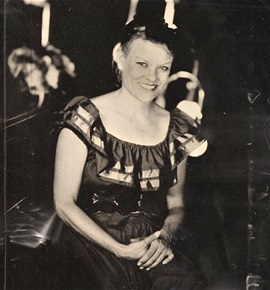 Photo by Magnolia Tintype Co. 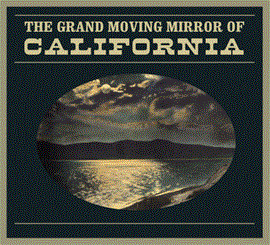 In 2005,a photo copy of the 1853 script for The Grand Moving Mirror of California, landed on the doorstep of the Velaslavasay Panorama, to the attention of museum director Sara Velas. The recently discovered script had been in storage at the Saco Museum in Saco, Maine. It was sent by moving panorama enthusiast (or fellow panoramaniac) Peter Morelli, who had worked for many years in recreating the Pilgrim's Progress moving panorama. The moving panorama painting did not surive. Peter thought perhaps Sara could recreate the moving panorama based on the script? 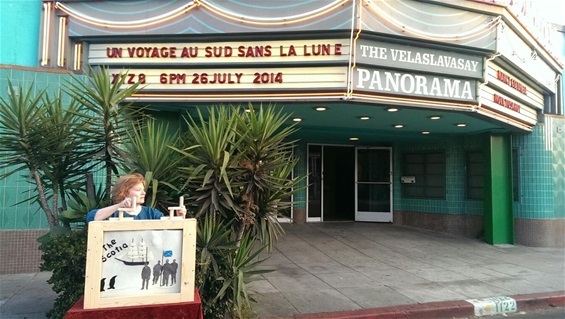 Sara, along with a diverse team of talented people, set out to recreate the moving panorama. 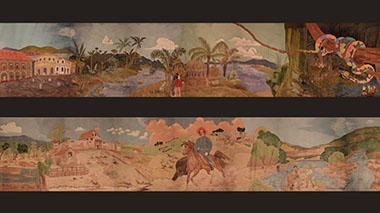 The painting depicts a seaboard trip around the South American continent to reach Gold Rush-era California. On the voyage they encounter rough seas at Cape Horn, poisonous snakes and other adventures! The show premiered in July 2010 at the glorious Velaslavasay Panorama. More details of the gorgeous painting. This is the ship Albatros. The beautiful moving panorama box with red velvet curtains. The scroll is four feet high. 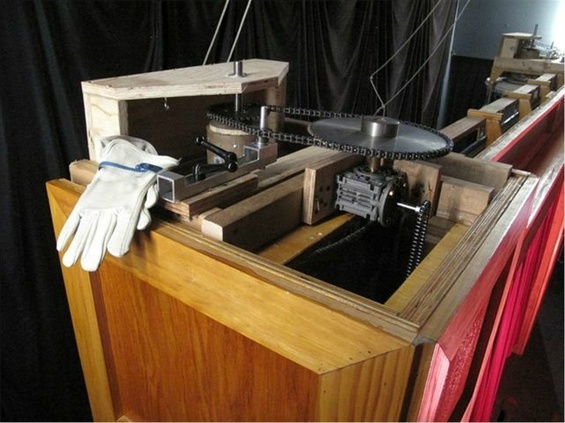 The box and cranking mechanism was made by Erik Newman. The design was based on a 19th Century moving panorama patent. Erik made improvements to that design, then drove the box from Chicago to LA in a 1981 VW Rabbit Diesel named Rosebud. Further adjustments were made by Brandy Kana. The cranking mechanism was in the front of the box, an unusual set up, very cool! Khylin Woodrow was the crankist. 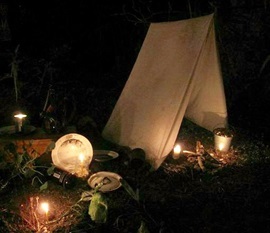 A dramatic display of Gold Rush artifacts were in the garden - a magical touch. They didn't stop at merely creating the painting with the cranking apparatus, narration and music (a Herculian task by itself). 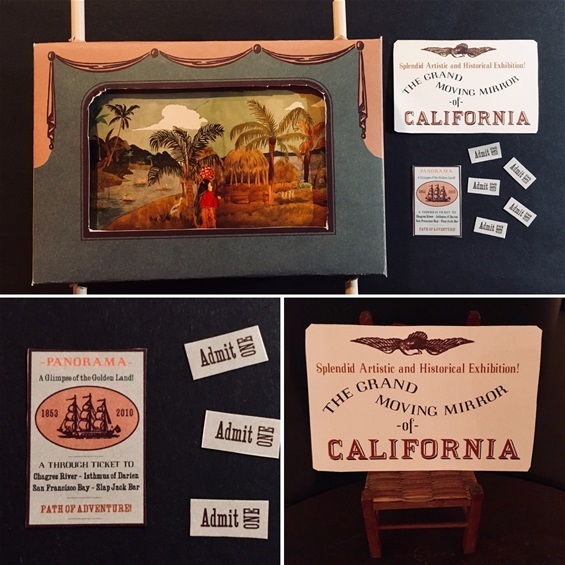 They went on to create other accompanying pieces in the spirit of 19th century moving panorama performances: flyers, miniature panorama souviners, a display of Gold Rush artifacts and a logo reminiscent of 19th century engravings. 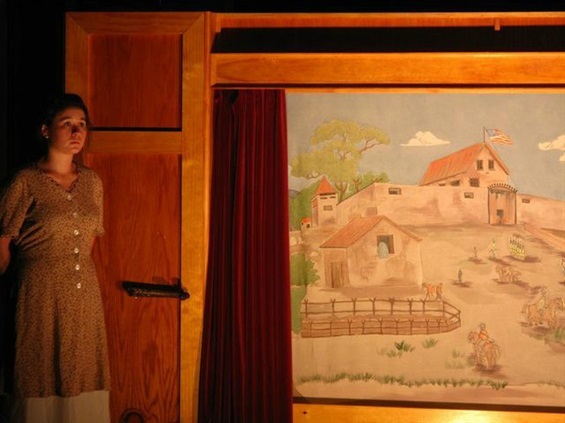 View a short excerpt of the performance. 2013/14 "The Grand Moving Mirror" was exhibited in Berlin, Germany as part of the Talking Picture Blues exhbit. They traveled to Seoul, Korea in June of 2015. A smaller size of the scroll was made for this performance. Read about it here. 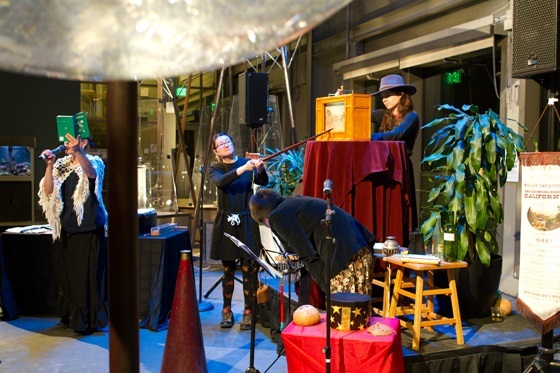 In March, 2018, it was performed at the San Francisco Exploratorium. Still a much smaller version of the painting was created, making it a lot easier to transport! That is Ruby Carlson behind the box as crankist! Read about it here. 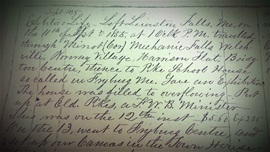 The diary was transcribed by moving panorama historian Suzanne Wray. Look at that 19th century handwriting! Not only did the script survive, but the diary of the moving panorama showman survived as well. Peter Morelli kindly shared it with me for this website. 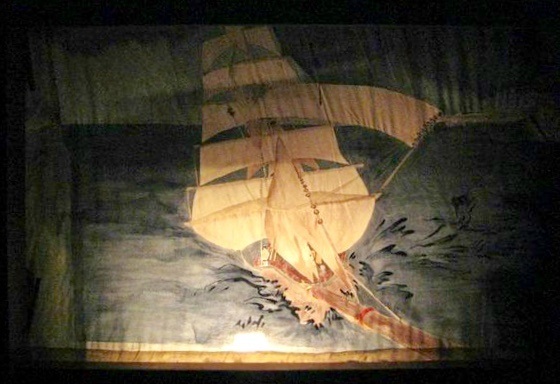 The painting was originally performed by Dr. L.E. Emerson. Emerson toured New Hampshire and Maine from Sept. 11th to Nov. 9th 1855, transporting the moving panorama in a horse drawn wagon through the mud and snow. Life as a moving panorama showman was not an easy one. I am waiting for a crankie artist to take the diary and run with it. It would make a great crankie! You can read it here. That's me, Sue Truman, in the street in front of the Velaslavasay. So glad that Sara could take a quick picture before I was off to the airport. In 2014, I had the honor to perform a couple crankies at the Velaslavasay Panorama. To read about my visit and see picture of the beautiful Velaslavasay, click here! This webpage created in 2012, updated January 2019, Sue Truman.